NASC were in Westminster earlier this month, with members Chris Sedgeman and Lynn Way of Chris Sedgeman Scaffolding Ltd, to meet with Nick Boles, Minister of State for Skills and Equalities – discussing the availability of training in the South West and proposals for the future of apprenticeships in the UK. 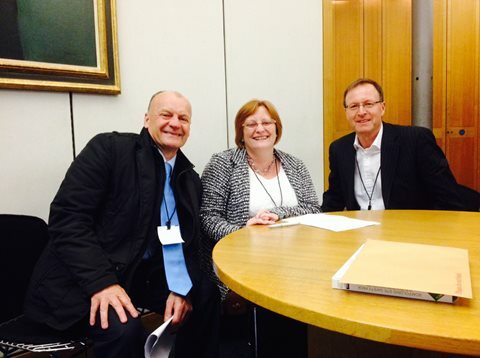 The meeting – which was attended by NASC MD, Robin James and NASC Director of Training, Dave Mosley – was brokered by Chris Sedgeman and Lynn Way, via their local Conservative MP candidate Derek Thomas (West Cornwall & the Isles of Scilly). Chris Sedgeman, Lynn Way from Chris Sedgeman Scaffolding Ltd and NASC Managing Director Robin James. They had met with Mr Thomas on several occasions to discuss concerns over the lack of available training in the South West region and their fears that proposed funding models for future apprenticeships would no longer be commercially viable for the scaffolding sector – having a detrimental effect on the whole industry. Their campaign follows a visit in May 2014 by the Chancellor, George Osborne, who had visited Chris Sedgeman’s scaffolding yard in Penzance following their scaffolding works while repairing the storm damaged mainline railway line at Dawlish. NASC Training Manager, Dave Mosley had also previously written to Mr Boles’ predecessor, Matthew Hancock, on behalf of the scaffolding sector to express the confederation’s “serious concern” over proposals that would see a requirement for an employer contribution of around £4000 to be paid upfront prior to taking on an apprentice. 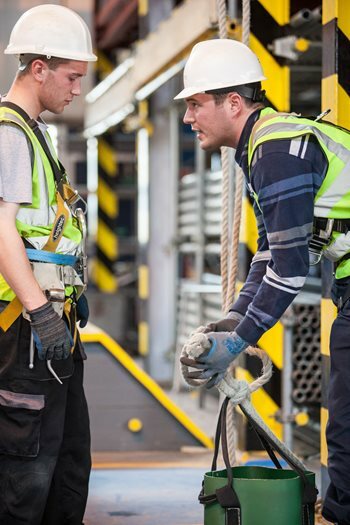 The NASC feared this would mean employers would look for alternative routes to training their workforce, away from the important apprenticeship route – which the NASC, CISRS and the scaffolding sector have supported since the late 1970s. More than 350 apprentices go through the CITB National Construction Colleges or private providers every year – more than any other industry. Indeed, the apprenticeship drive is still of vital concern to the NASC – as current President, Kevin Ward is highlighting with his two-year campaign to get member companies to create 400+ new scaffolding apprentices into the industry. Dave Mosley said: “This meeting was very positive. Mr Boles listened to our concerns and gave a very strong indication that some of the proposals currently being piloted in the ‘Trailblazer apprenticeship programme’ which we opposed (such as up front employer contributions and claiming funding for training through HMRC) may not be imposed once the pilot is completed. That’s good news for the scaffolding industry and apprenticeships, which are the lifeblood of our industry. For details about becoming an NASC member and to find out more about the current apprenticeship programme, TG20:13, or about the scaffold industry guidance trade body – please visit www.nasc.org.uk or email: enquiries@nasc.org.uk. And to discover more about CISRS scaffold training, please visit www.cisrs.org.uk. The NASC has received confirmation that funding has been secured from Construction Industry Training Board (CITB) which will enable them to run their 4th Qualifying The Workforce (QTW) programme, starting in January 2015. This follows three successful QTW programmes involving NASC members in 2012-2014, where proposed targets were exceeded on each occasion – with more than 200 operatives qualified to CISRS Scaffolder via either apprenticeships or the adult/commercial route, Advanced Scaffolder or Scaffolding Supervisor in 2012 and 2013. In 2014 the QTW programme also included payments for those undertaking the CISRS Operative Training Scheme (COTS) course for New Entrant Trainee and Scaffolding Labourers – with a £125 payment to the employer upon completion of training and issuing of the relevant CISRS cards. The CITB funding has allowed NASC not only to promote the concept of a fully qualified workforce to the scaffolding sector but also to pay out over £25,000 to participating members in 2012-2013, with a further £29,000 paid out in 2014. NASC received additional/exceptional funding from CITB in 2014 – in order to offer further support to the QTW programme. This will hopefully create an additional 100 qualified operatives (across all five CISRS training course categories) before the end of the year. In addition to the new QTW, NASC has also received CITB funding to run a batch of three-day, new-style Basic Scaffold Inspection Training Scheme (SITS) courses – which are open to non-NASC members and member companies. The courses will be running at NCC Scotland, Simian Skills and NCC Midlands (which NASC’s Ken Johnson will be attending). For further details about 2015 Qualifying The Workforce Training, three-day CISRS SITS courses and training changes following the introduction of TG20:13, information and dates on courses available or to find out more about CISRS, please visit www.cisrs.org.uk or email enquiries@cisrs.org.uk. And to obtain a copy of TG20:13, please visit www.nasc.org.uk/tg20_13. 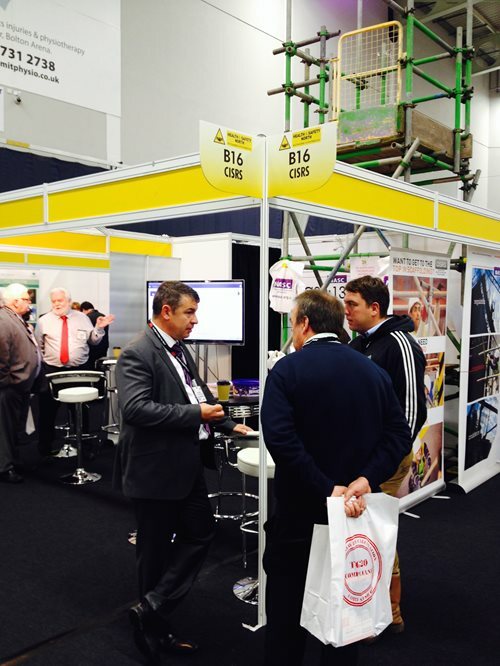 The NASC and CISRS had a successful exhibition at the Health & Safety North event held at Bolton Arena last week (October 8-9th 2014) attracting over 130 serious enquiries on scaffolding safety, standards and training to its 16m trade stand (B16), which featured a free-standing five metre tower, built by members 3D Scaffolding of Manchester. Three NASC staff and Simian Skills Director, Dave Randles actively promoted the work of the confederation, handed out useful scaffolding advice, promotional material and literature, and took enquiries from representatives of the construction and health and safety industries attending the event, which attracted over 2,000 visitors. The show gave the NASC another opportunity to showcase the innovative TG20:13 tube and fitting technical guidance – with many popular live demonstrations of the TG20:13 eGuide on the stand’s 52-inch plasma screen and on the eGuide Android device App, which provides a mobile, digital good practice guide for tube and fitting scaffolding. Copies of the NASC 2014 Health and Safety Report and CISRS CAP 609 General Information Booklet were also distributed, together with over 100 recent NASC/CISRS press releases and NASC promotional publications. Representatives of the Construction Industry Scaffolders Record Scheme (CISRS) sharing the stand were able to provide the latest information on SITS and COTS scaffolding training courses, along with information on changes to Part One, Part Two and Advanced scaffolding courses following the launch of TG20:13 earlier this year. And CISRS Training Provider, Simian Skills were invaluable in passing on the CISRS message, and benefits of TG20:13. Following on from the success of this event, the NASC & CISRS will now be attending the H&S Scotland event 22-23rd April 2015 at the SECC in Glasgow. For details about becoming an NASC member and to find out more about the NASC – the scaffold industry guidance trade body organisation – please visit www.nasc.org.uk or email: enquiries@nasc.org.uk. To obtain a copy of TG20:13, please visit www.nasc.org.uk/tg20_13. And for further details on the Construction Industry Scaffolders Record Scheme (CISRS), please visit www.cisrs.org.uk or email enquiries@cisrs.org.uk. NASC are proud to announce the launch of the NASC Apprentice of the Year Award, which is to be sponsored by both CITB and CISRS. The award is aimed at individuals who are currently directly employed with an NASC Member company and are either part way through a formal scaffolding apprenticeship with an approved CISRS provider or alternatively have successfully completed the apprenticeship programme in 2014. The successful candidate must be conscientious, have shown a willingness to learn and develop skills and have gone above and beyond the call of duty whilst working their way through the qualification. 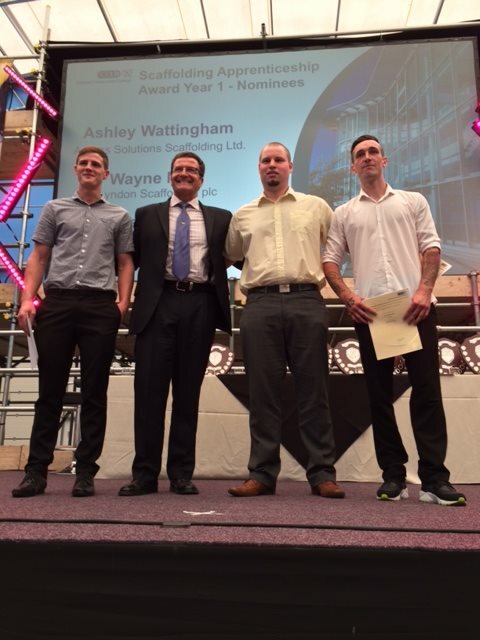 The judges would like to see evidence of someone who through hard work, personal development and a commitment to the industry would be viewed as a shining example to others looking to enter the scaffolding sector. Nominations must be received by Friday November 7th 2014. The winning apprentice will receive a trophy and a cash prize of £500, while the apprentice’s employer will also receive a trophy and £500 to be spent on CISRS training with an approved provider. The winner will be announced at the NASC AGM Friday 21st November 2014, in Manchester, with the presentation of the award to take place at the workplace of the winner at a mutually convenient date. Those wishing to enter the NASC Apprentice of the Year 2014 Award should go to the CISRS section in the member’s area on the NASC website. For details about becoming an NASC member and to find out more about TG20:13 and the NASC – the scaffold industry guidance trade body organisation – please visit www.nasc.org.uk or email: enquiries@nasc.org.uk. And to obtain a copy of TG20:13, please visit www.nasc.org.uk/tg20_13.